Valentine’s Day, probably, out of all the other days of the year has the most card-giving. Sure, we sent Christmas Cards, Birthday Cards etc. But Valentines are usually greater in number – and have a lot more variety. For that reason, it is one of my favorite Holidays to craft for. 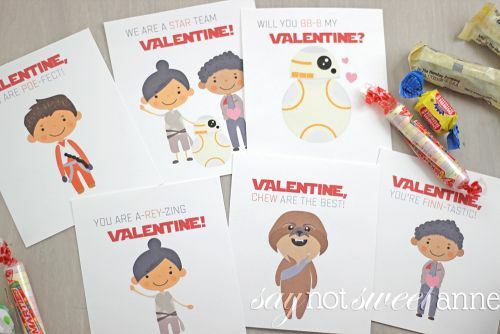 Check out last year’s Star Wars Valentines below. This year, I’ve got another set of free printables for you to enjoy! These Printable Valentine’s Day Cards are adorable, and perfect to print and give to your sweetie. You can print one, or print them all and leave them around the house! While everyone else is standing in line in the card aisle at the grocery store, you can head home and open some wine instead. Get the printable at the link above. Be sure to print on card stock, and maybe dress it up with some washi tape or glitter. Because what ISN’T better with glitter? (Dinner is the answer. Dinner is not better with glitter.